By connecting your Point-of-Sale or importing data into Tanda you can enhance your Reporting and Rostering functionality. You don't have to just import sales or revenue data, you can import any kind of demand data, including Transactions, Booking etc. Tanda currently has integrations with many systems, these are listed in the header tabs on this page. Select your integration and then follow the prompts to login and link your account. Different systems have different import times, ranging from every 15 minutes to daily, however once you have connected your system, this will automatically import your data. You will just need to return here each time you wish to import your data. The next step will be to join your Sales & Revenue data with your Locations & Teams on the Data Stream management page. If you haven't added Locations & Teams, have a look at this article on how to do this first. Once you've imported your data and have your Locations/Team setup, you just need to tell Tanda how you want to match this data. These relate to the data which has been imported from your Sales & Revenue system or CSV upload. All you need to do is match where this data relates to in your business in Tanda. Note: if your Sales data relates to the whole of your business (i.e not just one Team), it's best to have your Data Stream Cards added to all the headings, as in the video above. For businesses where you're importing multiple data streams to multiple areas in Tanda, you would just match the relevant stream under the relevant heading. In this example, we'll have a look at how to configure the Data Stream management page if your data relates to your whole business. 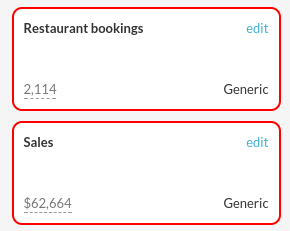 Our example business is a Restaurant which has imported Sales and Restaurant Booking data. In Tanda, we have a Location set for the restaurant venue and then Teams which are the Front of House, Kitchen and Management. 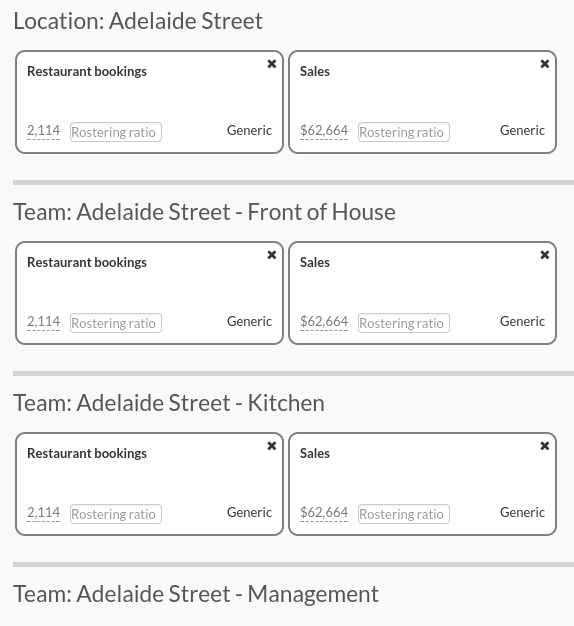 The data relates to the whole restaurant, so we're going to set our Data Stream Cards to Organisation, Location and Teams. This is so we can produce the largest range of Reports in Tanda. To do this, drag your Data Stream Cards from the left to sit under Organisation in the middle and you'll see they have turned from red to grey to show they're enabled. Then repeat this process to drag them again from the left to sit under Location and your Team(s). 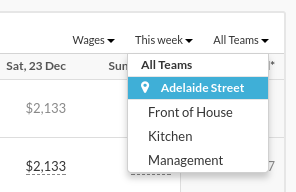 You don't have to assign the Cards to all Teams, in this example above we've left out Management as this Team doesn't contribute to Sales and Bookings for the Restaurant. Note: if you have any issues dragging cards or then deleting cards as you put them in the wrong heading, you might just need to refresh the page and try again. Note: To use Predictive Workforce or Cognitive Rostering, you'll need to have Cards sat under your Team headings. 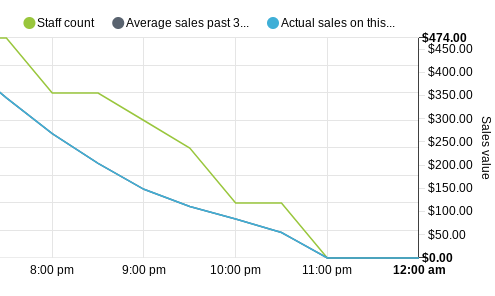 As a note, only Sales data will show here. 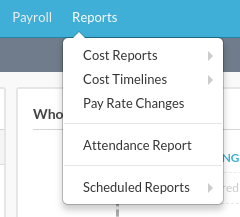 If you imported non-sale data, for example Bookings, it won't display in the Weekly Planner, as this is only Revenue. You can however view the data figure imported in the Data Stream Management page. This can be used to make better decisions when creating your roster and also forms the basis for using Tanda's Predictive Workforce and Cognitive Rostering. As noted above, if you want to use Predictive Workforce and Cognitive Rostering, just ensure you have your Data Stream Cards under the Team headings.